This sturdy kit is small enough to carry in your handbag, glovebox or travel bag, but versatile enough to deal with common problems that happen in the home or when travelling. It has been specifically designed to treat common problems associated with pregnancy, childbirth, and the first few years of life. 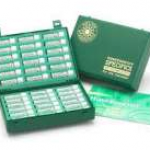 It comes with a 114-page booklet that contains clear and easy-to-follow instructions to help you find the right remedy quickly. 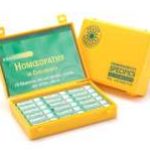 Contains 42 key remedies traditionally used by homeopaths during pregnancy, labour, birth and infancy. 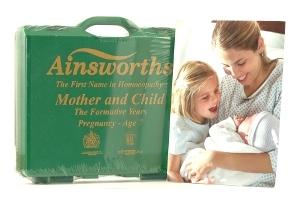 The accompanying booklet discusses how to use the remedies for symptoms arising from: Anxiety; arthritic and rheumatic pain; bedwetting; back pain; bites and stings; boils and abscesses; burns; chickenpox; childbirth and labour irregularities such as late labour, breech presentation; prolonged or difficult childbirth, Caesarian section; Post-childbirth irregularites such as bleeding, retained placenta, “baby blues”; lactation irregularities and mastitis; circumcision; clingy babies and infants; colds; cold sores; colic; constipation; coughs; cradle cap; cystitis; diarrhoea; earache and glue ear; eye-problems; fevers; grief; hangover; hay fever; headaches; indigestion and flatulence; influenza; injuries and bruising; itching and nettle rash; joint pains; measles; mumps; nappy rash; nausea and vomiting; nosebleeds; period pains; morning sickness; ligament pain; threatened miscarriage; sciatica; shingles; sinusitis and catarrh; sleep problems & nightmares; sore throat; sprains and strains; teething; thrush; toothache; travel sickness, and jet lag. 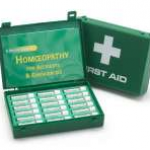 Remedies included in the kit: 1. Aconite napellis (Acon) 200c 2. Antimonium tartaricum (Ant-t) 30c 3. Apis mellifica (Apis) 30c 4. Arnica montana (Arn) 200c 5. Arsenicum album (Ars) 30c 6. Belladonna (bell) 200c 7. Bellis perennis (Bell-p) 200c 8. Calcarea carbonica (Calc) 30c 9. Carbo vegetabilis (Carb-v) 30c 10. Caulophyllum (Caul) 200c 11. Chamomilla (Cham) 30c 12. Cimicifuga racemosa (Cimic) 200c 13. Cocculus (Cocc) 30c 14. Colocynthis (Coloc) 30c 15. Dioscorea villosa (Dios) 30c 16. Drosera rotundifolia (Dros) 30c 17. 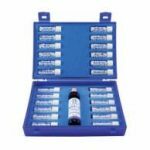 Ferrum phosphoricum (Ferr-p) 30c 18. Gelsemium sempervirens (Gels) 30c 19. Graphites (Graph) 30c 20. Hepar sulphuris (Hep) 30c 21. Hypericum perforatum (Hyper) 200c 22. Ignatia amara (Ign) 200c 23. Ipecacuanha (Ip) 30c 24. Kalium carbonicum (Kali-c) 200c 25. Kalium phosphoricum (Kali-p) 200c 26. Lycopodium clavatum (Lyc) 30c 27. Natrum muriaticum (Nat-m) 200c 28. Nux vomica (Nux-v) 30c 29. Passiflora co (Pass-co) 30c 30. Phosphorus (Phos) 30c 31. Pulsatilla pratensis (Puls) 30c 32. Phytolacca decandra (Phyt) 200c 33. Rhus toxicodendron (Rhus-t) 30c 34. Sabina (Sabin) 200c 35. Secale cornutum (Sec) 200c 36. Sepia (Sep) 30c 37. Silicea terra (Sil) 30c 38. Spongia tosta (Spong) 30c 39. Staphisagria (Staph) 30c 40. Sulphur (Sulph) 30c 41. Viburnum opulus (Vib) 200c 42. Urtica urens (Urt-u) 30c.